So this evening Jeff came home from b-ball with a large welt on his leg. So I figured that I would debut some of our "accidents" from playing basketball over the years. Can you see the bump? This is after 15 min of ice. Poor Jeff. 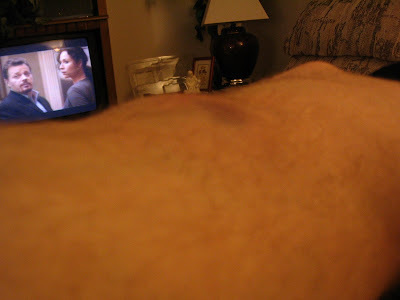 A little bruise starting. Jeff's swollen ankle that is still huge 2 years after. They took radiographs but said that it wasn't broken. I fractured a bone near the knuckle. Do you have any essential oils such as lavender, Melalueca, or oregano that could be massaged on your bruises, sprains, and injuries? They help considerably. Also soaking with Epsom salt or a small towel soaked in its solution is very healing. We look forward to visiting you no later than April 25 or 26. . . Will Shelley's family be there for her graduation? We love you, Shelley and Jeffrey! What the World - you guys have definitely been playing too hard! Time to stay home chill and relax all those bumps, bruises, and breaks.